Liczba stron: 462 Jest to ujednolicona liczba stron, która ułatwi Ci porównanie długości książek. Każda strona Legimi to 200 słów. A book On War and military strategy by Prussian general Carl Von Clausewitz. Clausewitz was among those intrigued by the manner in which the leaders of the French Revolution, especially Napoleon, had changed the conduct of war through their ability to motivate the populace and to gain access to the full resources of the state; thus unleashing war on a greater scale than had previously been seen in Europe. Clausewitz was well educated and had strong interests in art, history, science, and education. He was a professional soldier who spent a considerable part of his life fighting against Napoleon. The insights he gained from his political and military experiences, combined with a solid grasp of European history, provided the basis for the book. The recent set-back experienced by the Socialists in Germany is an illustration of my position. The Socialist leaders of that country are far behind the responsible Governors in their knowledge of the management of crowds. The latter had long before (in 1893, in fact) made their arrangements to prevent the spread of Socialistic propaganda beyond certain useful limits. As long as the Socialists only threatened capital they were not seriously interfered with, for the Government knew quite well that the undisputed sway of the employer was not for the ultimate good of the State. The standard of comfort must not be pitched too low if men are to be ready to die for their country. But the moment the Socialists began to interfere seriously with the discipline of the Army the word went round, and the Socialists lost heavily at the polls. Yet there are politicians in England so grossly ignorant of the German reading of the Napoleonic lessons that they expect that Nation to sacrifice the enormous advantage they have prepared by a whole century of self-sacrifice and practical patriotism by an appeal to a Court of Arbitration, and the further delays which must arise by going through the medieaeval formalities of recalling Ambassadors and exchanging ultimatums. 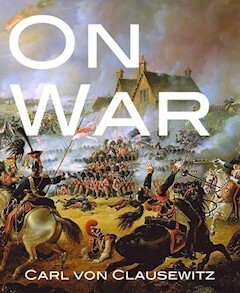 Most of our present-day politicians have made their money in business—a "form of human competition greatly resembling War," to paraphrase Clausewitz. Did they, when in the throes of such competition, send formal notice to their rivals of their plans to get the better of them in commerce? Did Mr. Carnegie, the arch-priest of Peace at any price, when he built up the Steel Trust, notify his competitors when and how he proposed to strike the blows which successively made him master of millions? Surely the Directors of a Great Nation may consider the interests of their shareholders—i.e., the people they govern—as sufficiently serious not to be endangered by the deliberate sacrifice of the preponderant position of readiness which generations of self-devotion, patriotism and wise forethought have won for them? Be mindful of thy name, and tremble not. Profit or ruin, victory or defeat. COL. F. N. MAUDE, C.B., late R.E. Theory was beginning to drift in this direction until the facts of the last War(*) taught it better. If War is an ACT of force, it belongs necessarily also to the feelings. If it does not originate in the feelings, it REACTS, more or less, upon them, and the extent of this reaction depends not on the degree of civilisation, but upon the importance and duration of the interests involved. (*) Clausewitz alludes here to the "Wars of Liberation,"
If, therefore, that side for which the present is favourable, is too weak to be able to dispense with the advantage of the defensive, he must put up with the unfavourable prospects which the future holds out; for it may still be better to fight a defensive battle in the unpromising future than to assume the offensive or make peace at present. Now, being convinced that the superiority of the defensive(*) (rightly understood) is very great, and much greater than may appear at first sight, we conceive that the greater number of those periods of inaction which occur in war are thus explained without involving any contradiction. The weaker the motives to action are, the more will those motives be absorbed and neutralised by this difference between attack and defence, the more frequently, therefore, will action in warfare be stopped, as indeed experience teaches. years the introduction of long-range weapons.